Well hello there! It's time for my monthly round-up of vintage treasures. May has been a simply fantastic month for finding things for my home. 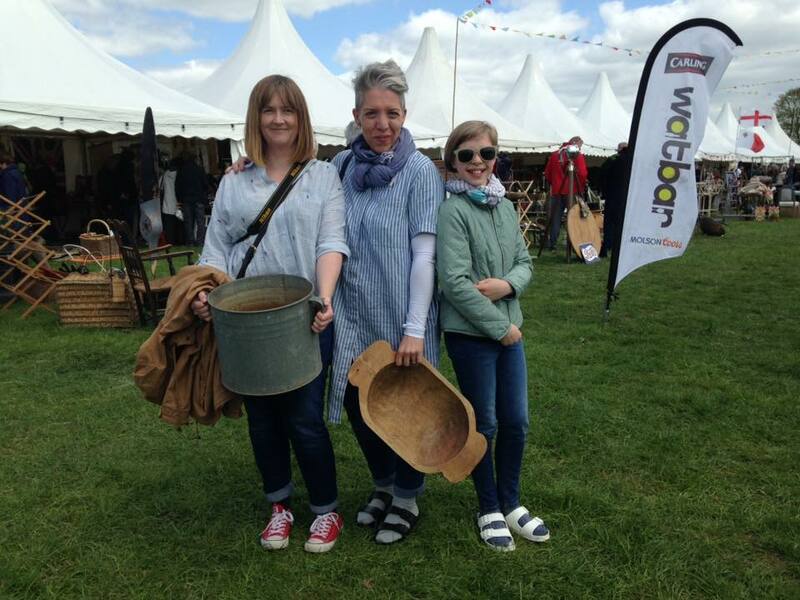 I've been busy scouring car boots, charity shops and of course visiting the wonderful Decorative Home and Salvage Fair at Ripley Castle. I was going to blog about this event but it was so busy that I felt I couldn't really do it justice, it was impossible to get in with my camera without loads of people gettting in the shot. However, my lovely chum Jane of Tea with Ruby has written and photographed a beautiful post all about it, which you can read here. She captured it so much better than I ever could (she has been going for years and is a bit of an expert, as well as being the most stylish person I know!) and I would definitely recommend it to all who are interested in finding quirky, original pieces for the home and garden. The next one is in September, and I'll be heading back then as there were so many things I wish I'd bought and didn't. 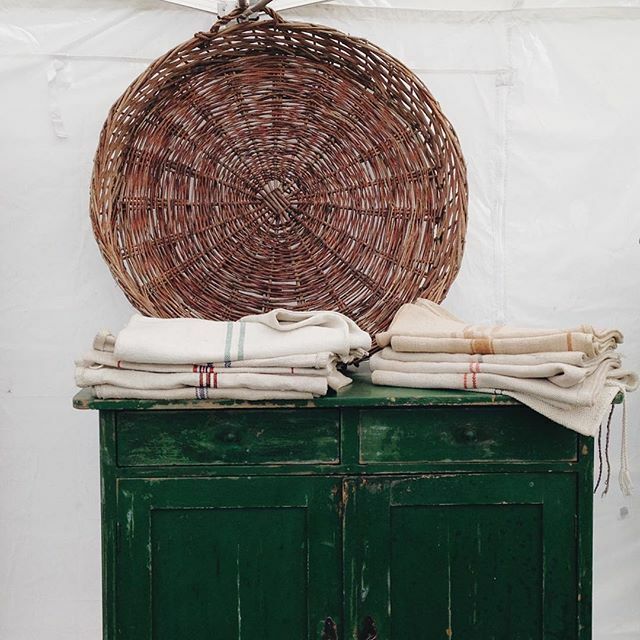 The four bigger pictures above are all from the Fair and were my favourite sellers - so beautifully styled under canvas and outdoors, how do they do that? I'd gone looking for a stool and a galvanised container to re-pot my bay tree in. I couldn't find a stool that worked size-wise, but I did get a beautiful pot and the tree has since been re-potted and looks super happy now. Not on my list (which was a bit naughty I know!) was vintage grain sack. I've always admired those cushions made from those sacks but that was as far as my knowledge of them went. And as I'm rubbish at anything crafty, I'd always rejected the idea of buying them to make cushion covers for my home. Chatting to Jane though I learned so many different ways to utilise them around the house and that they can even go in the washing machine. Who knew? Wow! So I was sold, and I bought one with a green and black stripe. It's now being used as a rug in the porch and I love it. A couple of weeks ago I mentioned hat I spent only a £1 at Otley car boot as I was there to sell and not to buy. But I did spot these three ceramic vessels in various different sizes and colours, so they were snapped up and now sit happily on the hearth. And then came the best buy of May, if not the year. Actually, no, make that ever. Driving past a local charity I happened to spot sitting outside on the pavement, two Ercol - style chairs. Now, I have been after some of these for a long time. I parked up to have a look at them, they looked pretty good and so I went inside to find out how much they were. At this point my eyes nearly popped out my head, for tucked away in the corner of the shop were two genuine vintage Ercol kitchen chairs. Well that was me sold. And oh my word, I got them for a brilliant price. I've since discovered they are Model 608 kitchen chairs which came out in the late 1970s, early 80s and are quite rare as they have four central spindles instead of three. They are solid, a little grubby but apart from needing a bit of a clean, pretty darned gorgeous. I am over the moon at finding these and I know that I got very, very lucky. *Image of myself with Jane and her daughter from the Arthur Swallow Facebook page.